Turing the remains of Medinet Habu, we find the plan of the ancient Egyptian houses basically similar to those at Amarna : Square of almost square with an antechamber leading into the main living room with columns and dais . Although it is perhaps dangerous to generalize from so few examples, it is not unreasonable to suppose that this 'villa' type of housing was common is unplanned Egyptian settlements. There is , however, one interesting example which points to another type of housing which may have existed in the residential districts of old, established cities such as Thebes. This is found in a scene from the tomb of Djehuty Nefer at Thebes and shows a multi-story type of "town house". The right hand part of he scene missing. this may have shown the main door and entrance loggia of the ancient Egyptian house . Above where the entrance should be are the fragmentary remains of two rooms with servants at work .These may be the bedrooms, or possibly servant's quarters or workrooms. A staircase runs the full height of the house and further servants are shown carrying food and vessels up to the roof. At the top of the staircase is a canopied area which could well be a kitchen, for a servant is shown preparing good and to locate the kitchen on the open roof would ensure that cooking smells open were carried away over the rooftops. Also on the roof are a number of storage bins and grain silos. The basement of the ancient Egyptian houses is given over to other domestic activities such as spinning and weaving , the grinding of corn and sieving of grain. The ceiling is supported by very solid, but plain, columns. The first floor of the house contains the main apartments. Servants are shown carrying food through an antechamber to their master, Djehuty-nefer , who is seated on a chair placed on the ubiquitous dais. Servants proffer him flowers and food. The doorway into this chamber is elaborately decorated with a lattice-work pattern. The roof of the chamber of characteristically high and the rafters are decorated in a block design. The columns supporting the roof are also decorated and all these features would have been brightly painted . The living room is lit by clerestory windows near the ceiling. On the top floor of the house Djehuty-nefer is shown working in his office . Servants carry produce into his presence to be inspected and recorded by scribes. The bearers have to ascend a short flight off steps to enter the office. Its height above the other rooms on this floor is a result of its position above the living room, which is taller than the other rooms of the ancient Egyptian house . This added height carries in to the roof and a flight of steps can be seen leading to a group of five storage bins. An impression of the exterior of such a 'town house' may be gained from a limestone model. This depicts a tall, thin house, with a narrow doorway raised above ground level. Widows set at different levels indicate the floors. The lower set have simple cross bars, the upper ones are latticed. The tops of the walls form a parapet around the roof, creating a courtyard, The brickwork or decorated plaster is shown by horizontal bands running round the building and the small rectangles which appear in courses may be timber supports. Another , much simpler, house model reveals a common type of doorway found in ancient Egyptian houses, which imitates the entrance to a temple. the jambs and lintels would probably have been made of wood covered with plaster and in this case they are painted with red and black stripes. Set into the side wall of the model are windows and on the roof is a small court with a shelter to one side. Ra'ia has built a godly villa which is opposite Edjo. He built it on the verge(of the river ) as a work of eternity and planted trees on every side of it. A channel is dug in front of it , and sleep us broken (only) by the sight of it ; one is gay at its portal and drunk in its hall. Fine doorposts hewn anew, and walls inlaid with lapis lazuli. Its granaries are supplied a fowl-yard and an aviary with ro-geese; byres full of oxen : a breeding pond with geese; horses in the stable ; (boats) are moored at its quay . The poor, old and young m come to live in its neighborhood. Your sustenance is assured ...Joy dwells within it . The architectural reality of this type villa estate can be found in the great mansions of El- Amarna, eve if here the setting is less idyllic. The great villas lie at the heart of estates surrounded by mud-brick enclosure walls. Around each house are a number of outbuildings servant's quarters, including a house for the steward , kitchens stables , workrooms, and a number of circular granaries. The purpose of these was probably to store the grain which was paid as subsistence to the dependents who lived outside the walls of the estate. 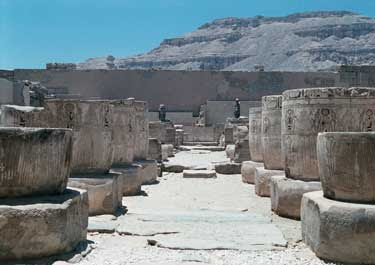 A major feature of the Amarna walled mansions is the open space which formed the garden. Gardens were the delight of the ancient Egyptians. There they grew multitudes of brilliant flowers and trees for shade and nurtured fruits and vegetables which required constant watering . A central feature of these gardens were pools , which were both decorative and provided the water for irrigation .The remains of such pols, or possibly wells, are shown as dotted lines on the plan of Amarna houses. Wells are in fact more likely in this case as the city was built beyond the limit of cultivation and the water table was too deep for pools to be viable. A house complete with its garden is depicted in the Book of the Dead Nakhte , a royal scribe of the Eighteenth Dynasty . Nakhte and his wife are shown standing in front of their house , before which are planted a fruit tree and a date palm for ornament and shade. The form of the house i greatly simplified but shows several interesting features. The walls are whitewashed to reflect the heat , Like those of many houses in Egypt today. the elaborate doorway is coloured reddish-brown, as are the windows, probably indicating that they were made of wood , The lattice windows are shown high up on the wall and may and may be clerestory windows for the main room. On the roof are two triangular vents . These were designed to catch the cooling breezes , greatly desired and prayed for by the Ancient Egyptians. An idea of a more humble rural home may be gained from a series of models placed in tombs the middle Kingdom ,known as 'soul houses' . In the evening lamps were lit were lit during the brief interlude following the evening meal before the household went early to bed , to rise again at dawn. These were for the most part simple bowls of of pottery or stone containing oil and a wick . They could be placed on the floor or higher up in wall niches .Examples of lamp stands have been found , consisting of a column, sometimes in papyrus form , on top of which are three pages supporting a bowl which forms the lam proper. Potter torches are also knows ; these were set in bracket on the wall.